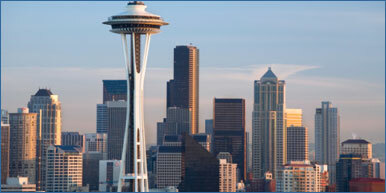 Because I left my ID in my running shorts I was forced to fly standby to Seattle. In order to arrive by the 6pm tipoff, I needed someone also headed to Seattle to pass in the last second on their seat. Turns out that happens a lot. I made the flight. Basketball-wise, have the Bruins really jumped into the Dance? Do the Cardinal not want to dance? Can Zack LaVine fly? Do you think Kevin O’Neill saw 50 Shades? March approaches and it’s going to be tough to find two-and-a-half hours to watch both parts 1 and 2 of the SNL 40 special. The state of Arizona has not produced a wealth of basketball talent. Just 19 NBA players prepped in the Grand Canyon State, Greg Smith the most recent and Sean Elliott the most successful. Mike Bibby, born in Phoenix and attended HS at Shadow Mountain, played the most NBA games of any Zonie, 1001. Arizona produced pros have played 125 cumulative seasons in The League. Comparatively, The Palmetto State (South Carolina) has produced 21 pros playing 170 seasons. Two additional pros, 45 mores seasons. By that sophomoric arithmetic, Arizonans generally aren’t that great of hoopsters. Those nineteen pros rank just 35th in America, ahead of Utah’s 17 (Shawn Bradley!) and behind the aforementioned 21 from SC (Jesus Shuttlesworth) and West Virginia (Logo). So when players from the state move on to play Division 1 basketball, it’s a significant accomplishment. And when players in the state start scoring 40 points in a game or flirting with triple doubles, we’re on to something special. Something special is what former Phoenix-area prep stars Jahii Carson and Nick Johnson are doing. Hailing from the same state as me, they chose to compete for rival universities and they’re currently crushing the college basketball scene. Let’s start with Carson, the riquickulous one, who almost single handedly defeated the Runnin’ Rebels Tuesday night. He scored 40 points and dished 7 assists. He played 39 minutes and in case you needed a refresher, college basketball games are 40 minutes long. He shot 64% afield and bucketed 1.02 points per minute. He’s a measly 5’10” and made 14 of his sixteen shots AT THE RIM. Do you realize that UNLV has blocked the ninth most shots in the nation (30)? That their 7.5 blocks per game rank fifteenth nationally? The Rebels saw Carson driving the lane and they were licking their chops, ready to put Carson’s shot into XS. Instead, they’re licking their wounds as Carson tear dropped his way – and how beautiful a shot is that floater? – to 40 points and the Devil’s first 5-0 start since Arizona was one year into 27 consecutive NCAA tournaments. What Carson has done in Tempe is nothing short of angelic. On this, his farewell tour, Carson is about to make sure we won’t soon forget his name. He’ll be remembered in the same breath as Fat Lever, Eddie House, and James Harden. But like Lever before him, he’ll be special because of his Arizona ties. Lever prepped in Tucson, at Pueblo High School. The same HS I never lost to as a starting baseball player and where I got a 4 on a botched administration of the AP Spanish test (though honestly it could’ve been a 3). He’s a legend in the state. And while Nick Johnson spent a portion of his prep years at Findlay in Las Vegas, make no mistake that he has strong ties as an Arizonan. His father is Joe Johnson who famously held the world record for dunking on the highest rim (11’7”) and attended ASU. Nick grew up in Gilbert before honing his skills at prep school. He now finds himself the centerpiece of a Final Four contender. His role, a changing one according to Sean Miller, is to be the leader of that team. High stakes for anyone, let alone an Arizona prep star. Allow me some other names who’ve held similar roles: Mike Bibby, Sean Elliott, Channing Frye, Richard Jefferson. Just one of those players never attended a Final Four (Frye) and we’re not going to talk about it. Every one of them was a lottery pick. That’s the sort of rare and special territory Johnson now finds himself in. 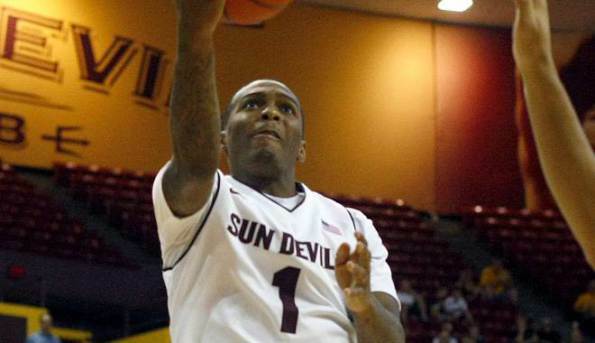 On Tuesday night, Johnson continued his onslaught of Arizona’s non-conference slate. And while it’s not been the most impressive competition, Johnson has been the Wildcats’ rock. Though it’s really too early to try and quantify his season, I’ll qualify it by citing his 23 points inside a raucous and hostile Viejas Arena. Early in the game Johnson squared up and hit a deep three pointer. Across most possessions, this might have been considered ill advised. But I thought it served as a message to his team. That it was OK for them to compete and that he had their backs. Sure the bucket may have come well before the first media timeout, but it resonated across his bench: Game on. That’s Johnson’s new role, while Carson’s remains about the same: to be really damn good. They’re both fine ball players who grew up playing with and against one another. As the adage goes, you’ve got to play the best to be the best. Today they find that they’re the best after years of Middle school, playground, AAU, high school, and now college competition. Challenging one another to get better and better. And that drive and competition has perhaps left something of a legacy. Jaron Hopkins out of Dobson High (2013) garnered big offers before winding up at Tad boyle’s blossoming program in Boulder. Michael Humphrey’s (Sunnyslope, #80 2014) is a big out of PHX and is headed to Stanford with fellow Zonie, Dorian Pickins (Pinnacle, 2014). Meanwhile, Zylan Cheatham (South Mountain, #68 2014) is headed to SDSU. But that’s the future and we can keep an eye on that for another time. For now, let’s enjoy what Johnson and Carson are doing. It doesn’t happen often. But when I told a third party – a non-Wildcat with no emotional ties to what happened inside the late RCA Dome of Indianapolis in 1997 – I came to realize that the late-90’s was a lifetime ago. Seriously, someone born that year is driving today. A motor vehicle. And the Champions Classic so gloriously hosted on Tuesday didn’t bother to invite Arizona because Mike Bibby. Arizona has been a terrific basketball school. They’ve danced on par with the elite and they’ve tasted success on an annual basis that few have. But the 1997 title was a long time ago. Much has transpired in the Old Pueblo since I watched the basketball team address fans in the football stadium on a spring afternoon. That was a glorious day and beautiful times. But that third party highlighted for me that ’97 is approaching a generation ago. Do they snap chat? Arizona was uncomfortably close to being the snap chat of elite basketball programs: a flash genius and gone for eternity. But Sean Miller said yes to Jim Livengood’s pleas. And so too has Stanley Johnson. The Wildcats are in the midst of a season with the potential to stand on a ladder with scissors, have a Jim Nantz pun thrown at us, and later visit the Obamas. 1997 was a long time ago but it’s imagery is as real as ever. It’s the banner Stanley Johnson and every other kid that’s agreed to Sean was sold on. When the Aztecs cut last night’s lead to four, with The Show and the rest of Viejas swelling, Aaron Gordon absorbed the harm and dunked. Seats were re-acquired or exited. It was the kind of moment that suggests a team is built for big things. The kind of team and program Stanley Johnson wants to be a part. And wants to build. Basketball games in football stadiums. The decision maker, the guy with the ball in his hand, the one who’s making critical plays at critical moments, those are the game changers. The ones who can – with equal skill – hit the big three or find the right guy to do such. Guard play, perhaps above all else, determines championship caliber teams and the Pac-12 has been chock full of some greats. Run up and down some of the other rosters I’m competing against in this Fantasy Draft and you’re reminded that the Conference of Champions has produced Walt Hazzard, Gary Payton, and Jason Kidd. Woof. But this draft wasn’t about scoring an individual. If that were the case we’d have handed this thing over to Andy over at Building the Dam once he picked Lew Alcindor. It was about compiling a squad and you’re about to be treated to the deepest guard corps. Ever. Mighty Mouse could utterly fill the tin. He was quicker than Wyatt Earp on the draw and just as tough. You kinda have to be if you’re going to be a sub-six foot lottery pick. And sure, he may have been a contributing member to the Jailblazers but you know what? After attending rehab and probably some long looks in the mirror, Stoudamire took a bet with columnist Jay Canzano that the sportswriter could piss test him whenever he wanted. So when Canzano showed up pre-game with a cup for Damon to fill, he did it and passed the test. THC free. I built this team on talent but some accountability certainly never hurt a contender either. 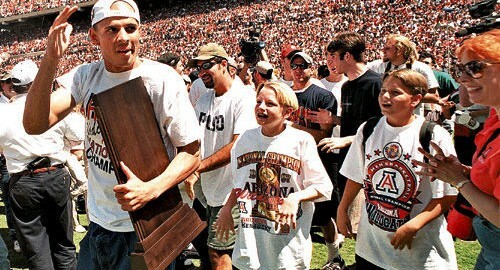 I’ll write a lot of brag-worthy things whilst waxing poetic about this team I’ve compiled but none holds more clout than “NCAA Champion.” Bibby hoisted the hardware and cut down the nets as a freshman. He then went on to earn POY honors on a team where he wasn’t even the leading scorer; a fact I don’t quite know what to do with but it probably means people thought pretty highly of his value to a basketball team. So I wanted him on my team. Remember how I told you NCAA Champion was the most baller thing I could tell you about someone? Dickerson’s got that. He also just happens to be the same Cat (pun intended) who outscored the ’98 Pac-10 POY (Bibby) and who had the smoothest, most effortless game of any Wildcat. Ever. He may have spoke softly but when it came to putting the ball in the basket, he was real loud. The cousin of my first guard selected (Damon), Salim is going to make any All-Time Favorite Wildcats list that I make and he probably should make yours too because of his Brag Sheet item. You’ll recall JJ-mania over the same four years Salim played and so you just had a visceral reaction when you read his name. Well know that in 2005, Salim shot greater than 50% from three-point land. Do you want to swallow the comparison? Ok, JJ’s best year was .421. Meh, solid, not hyperbole good. Salim.